Ok, not because I'm a vegetarian or anything like that - they were just so pretty and perfect they didn't need any ham! Actually I'm sure my bacon-grubber of a husband would probably say anything is better with some bacon - but he loved them too! 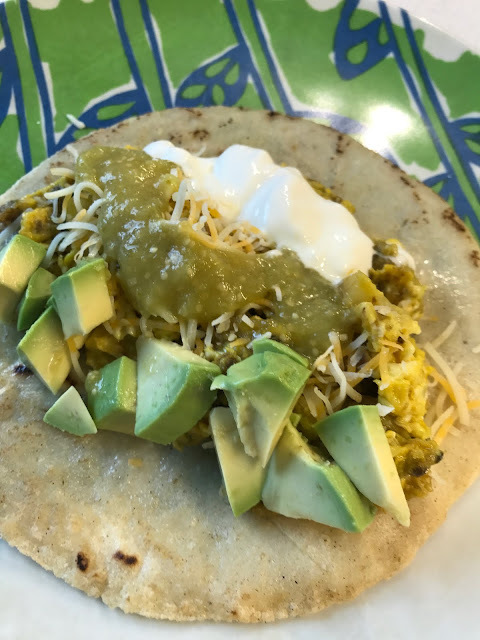 It's finally avocado season again and eggs are back too so this was my delicious breakfast - I'm sure they would make a lovely brunch or lunch too - hell I can imagine a damn fine dinner too - maybe add some refried beans and you are set! Anyway - these are my Scrambled Eggs with Potatoes and Peppers - with a few green toppings - I had some tomatillo salsa in the freezer and some freshly made corn tortillas from the Santa Rosa Farmer's market - and let me tell you - they were awesome Green Eggs! Post Note: I actually even had the sautéed poblano and onion mixture in my freezer too - you know I'm the Freezer Queen!